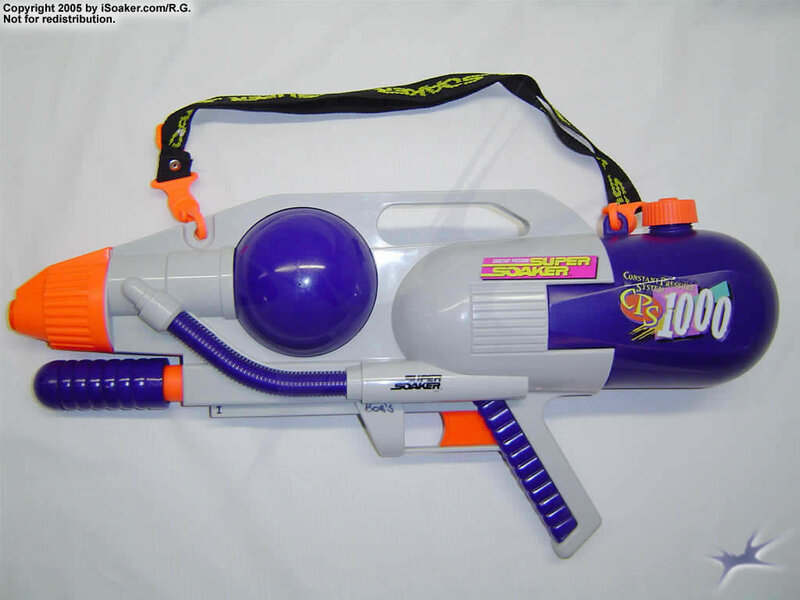 The Super Soaker CPS 1000 is a potent, mid-sized water blaster, providing excellent water power for its relatively small size (especially when compared to blasters like the Super Soaker Monster XL). The general construction of the CPS 1000 is strong, able to take a good deal of punishment without fear of breaking the blaster. For ease of carrying and filling, the CPS 1000 has both a shoulder strap and a built-in handle. The reservoir cap easily screws on and off. As well, it has an attached tether/anchor to prevent its loss. Its 5x-rated aperture unleashes a powerful, long-range stream from its mid-sized CPS pressure chamber. Pumping up the firing chamber does take a fair number of pumps to fill, but the blaster is operational after only a few. This, together with its 2.3L water reservoir, makes the CPS 1000 a formidable weapon on the water war front. The Super Soaker CPS 1000 is a great all-purpose blaster, perfect for use as a primary blaster. It can also be used as a "heavier"-type backup weapon if one is using a larger CPS model as a main weapon. Mid-sized, light, easy to carry especially thanks to its shoulder strap. For its size, it packs excellent power and stream size. It also does not take too much effort to pump up the firing chamber. The CPS 1000 was released in 1998 part of the legendary CPS line up back then. I remember this was the first CPS soaker I ever got that introduced me to the sheer power of CPS, although I had a CPS 1-3-5 before it that doesn’t really count since it’s so bad for a CPS soaker. This soaker has pretty much everything to give your enemies an itchy backside. It’s got looks, reliability, power, range, soakage and the ability to be very agile because it’s so light holding around 2.3L of water. The 5x nozzle is a simple no nonsense nozzle that really does the job on opponents, giving a good rioty blast. The colours of the soaker are also very good and simple being gray, blue and a bit of orange. It looks like a baby CPS 2000, that’s not a bad thing either. The CPS 1000 also comes with a strap which is always a plus. In terms of actual power, there is enough there to make opponents hold back, like a monster retreating back to its cage after being humiliated by a midget, speaking of which it applies the same here, as the CPS 1000 has around the same power as the Monster X and XL. That’s pretty impressive for a soaker this small and cheap. The XP 110 is around the same size and has far less power! Pumping is also pretty quick and easy, it’s like outrunning someone who tries their best but then after a second or two gives up and can’t be bothered anymore. There are one or two places the 1000 falls down. One being the fact the pump is not tracked, so if you cross the stupid line too far it will snap and break, making the soaker useless until you repair it. Because of the explosive power combined with the not small but not big either firing chamber you’ll run out pretty quick if you go a bit too crazy on the trigger. You’ll get 3 shots per tank and then a bit more, so it’s limited, but again what do you expect from a smaller CPS blaster. Overall, flaws aside, this is still an amazing soaker. If you want a simple, light, reliable, yet powerful old CPS soaker that doesn’t cost that much compared to what some blasters are fetching now, then the CPS 1000 is a great choice. It has pretty much everything you need for a basic soaker without any major problems that bring it down. Most air pressure soaker users should be easy, along with all the new crap out at present. The 1000 is also good against similar sized blasters as well as the underpowered Monster line. Anything bigger like the 1500 and up you’ll need to start relying on yourself a bit more. Also watch for the older powerful XP’s. Most air pressure soaker users watch out. Blasters of a similar size like the 1200 and 2100 will be a good match. Blasters like the 1500 or bigger will be a problem to a 1000 user; however you still need to watch out. I must say, when I was pondering my selection for first CPS soaker ever, I read that this was power in a small package. I'll admit I was skeptical about this, but when the 1000 came in the mail and I tested it… Whoa! This beast can outsoak every soaker except larger CPSs, Monsters, and homemades/modded guns. The colours aren't particularly good or bad. This is a great soaker. Period. The CPS 1000 has a strap, a tethered cap, a carrying handle, a simple, and an overall good, comfortable design. All it lacks is a tracked pump, and if it had one, it would be perfect. The Super Soaker CPS 1000 is perfect if you need a lot of power, and great range, but in a light and portable design. Ideal for long range shooting and medium engagements, the Super Soaker CPS 1000 makes the perfect primary or heavy backup weapon. able fight head on against CPS soakers with higher soakage. It is more of a sniping, mobile, untelegraphed weapon and, used as such, will prove to be very helpful in battle. Its mobility and power is its strength. It also has a nice look. The CPS 1000's shape and colour scheme makes it appear like a small CPS 2000. As a side arm, I would recommend a Max-D 6000, Max-D Secret Strike, and a CPS 2100. A CPS 1000 and CPS 2100 would make an excellent team. If you ever see a CPS 1000 at your local store, buy it. It is very rare now since it has been discontinued for over 3 years. And even if it wasn't a rarity, it is still a good soaker to use in battle. This was one of my favorite soakers. Unfortunately, the pump snapped off so it is no longer of use. It was a great blaster. It combined light weight, a considerable amount of water, and even a strap. The 5x nozzle is a good choice considering the size of the pressure chamber and reservoir. The range is also respectable. Overall, this is a great blaster: small enough for children and still satisfying for adults. Pros: Good soaking to water amount ratio. Very light and also includes a shoulder strap. Size: 23 in. x 11 1/4 in. The CPS-1000 is an excellent Super Soaker. It may seem small, but is indeed very powerful. This is a very versatile water blaster. The CPS-1000 is the smallest blasterin the CPS line. However, appearances are sometimes deceiving. This little blaster packs a lot of punch. When I first got it, I expected it to be another smaller blaster. When I filled it up though, I was surprised at the power. So was my unfortunate friend who fought me with my XP-110. This blaster is small and light which makes it easy to run or climb with. The shoulder strap makes it easy to carry. The CPS-1000 blows out a 5x rated blast from its decent sized CPS pressure chamber. Unfortunately, the water supply is limited which means you will be refilling a lot. PROs: Small, light. Shoulder strap makes it easy to carry. Excellent power for its size.